Ajay- Congrats for making on the first page of hacker news with R-Fiddle .What were your motivations for making http://www.r-fiddle.org/. Jonathan- Thank you. I must admit it was very exciting to be mentioned on Hacker News, since a lot of people were exposed to the R-fiddle project immediately. In addition, it was a first good test on how our servers would perform! Jonathan- When we started working on the www.datamind.org platform, we did an online survey to find out whether there would be interest in an interactive learning platform for R and statistics. Although the survey was not on this topic, one of the most striking findings was that a large percentage of R users apparently is frustrated about the documentation of R and its packages. This is interesting since it not only frustrates current users, but it also increases the barrier to entry for new R users and hence puts a brake on the growth and adoption of R as a language. It is mainly for the latter reason we started building Rdocumentation. The whole focus is on usability and letting all users contribute to make the documentation stronger. By the end of next week, we’ll launch a new version of Rdocumentation, that introduces advanced search functionality for all R functions, shows the popularity of R packages and much more. So make sure to www.Rdocumentation.org for updates! Jonathan- The response to the beta version of DataMind has been great, thousands of learners signed up and took the demo course. We are talking to some of the leading companies in the space and some very well-known professors to develop courses together. It is too soon to disclose details, but we will put regular updates on www.datamind.org! Corporates interested in what we do should definitely get in contact with Martijn@datamind.org. Ajay- Would it be accurate to call http://www.r-fiddle.org/#/ a browser based GUI for R on the cloud . What enhancements can be we expect in the future? 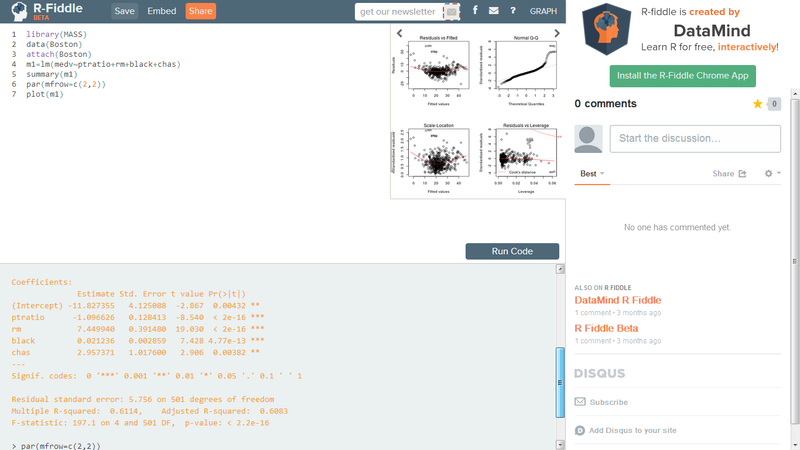 Jonathan- R-fiddle is indeed a browser based GUI for R on the cloud. We have a lot of ideas to improve and extend it. 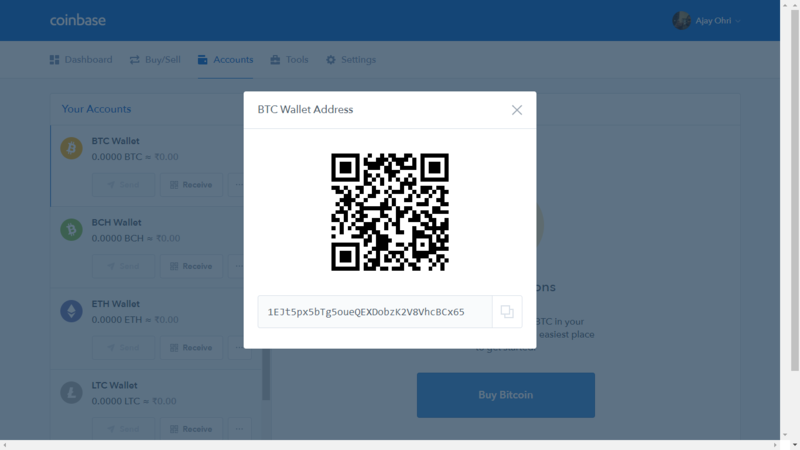 Some of the ideas are: the ability for users to concurrently make changes to a fiddle (Google-docs-style), support for loading data sets, github integration, better security management, lists of popular fiddles or fiddles from popular people, etc. However, the strong point about R-fiddle is that it is really simple and there is absolutely no friction to start using it. In that respect, we want to differentiate R-fiddle from more advanced solutions such as StatAce or Rstudio Server, which focus on more advanced R users or R usage. Ajay- You described your architecture for datamind.org at http://blog.datamind.org/ which is very open and transparent of you. What is the architecture for http://www.r-fiddle.org/#/ and what is it based out of? Jonathan- That’s an easy one. Although some details differ obviously, from a high-level perspectiveDataMind.org and R-fiddle.org have exactly the same IT architecture. Jonathan- Since we launched DataMind, we were inundated by requests from teachers and industry experts eager to contribute their own coursework on the site. But up until last week, it was only possible to take courses instead of creating them yourself. We decided to change this since we do not want to be solely a content company, but also a platform for others to create courses. Furthermore, by expanding DataMind with a content creation tool, we go beyond our naturally limited in-house ability to create courses. Now DataMind is ready to become a full on ecosystem to facilitate education between our users. Ajay- Are you self funded- any funding constraints based on being based in Europe? Jonathan- We are a Belgian company, founded in November of this 2013 by Dieter De Mesmaeker, Martijn Theuwissen and myself. However, the DataMind team travelled to Santagio (Chile) last week to participate in the Start-up Chile incubator for the next 6 months (which offers $40k in equity-free funding and mentoring). Here in Santiago, a fourth team member Bram Jans joined us. Furthermore, we have raised $135k seed capital from the iMinds incubator in Belgium to market and further develop the technology. Next summer, we’d like to raise more capital to be able to execute faster on our strategy towards monetization. Tech savvy investors with an interest/network in the statistics and data science area, or in online education, can always send a mail to Jonathan@datamind.org to discuss potential collaboration. Jonathan- We are convinced that cloud solutions are the future of teaching and learning in general. The main problem with the first wave of online education solutions (such as Coursera, EdX, Udacity, etc.) is that they “only” make a copy of the classroom online instead of leveraging technology to create a more engaging and efficient learning experience and interface. Therefore, I don’t think the future is in generic learning solutions. Learning interfaces will differ from domain to domain. Good examples are:Duolingo.com to learn languages, or Codeschool.com to learn web development. We are on a mission to build the best learning solutions for statistics and data science. 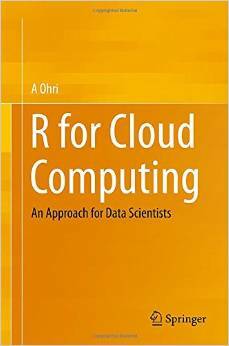 Ajay- What are some of the other ways we can help make R more popular on the cloud? 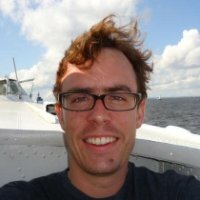 Jonathan- I really like the vision behind StatAce.com, and I think something like it will definitely increase further adoption of R. It is somewhat surprising that Rstudio is not offering something like that, but my assumption is they are working on it. That being said, what would be really cool is a very easy-to-use graphical user interface with R under the hood. 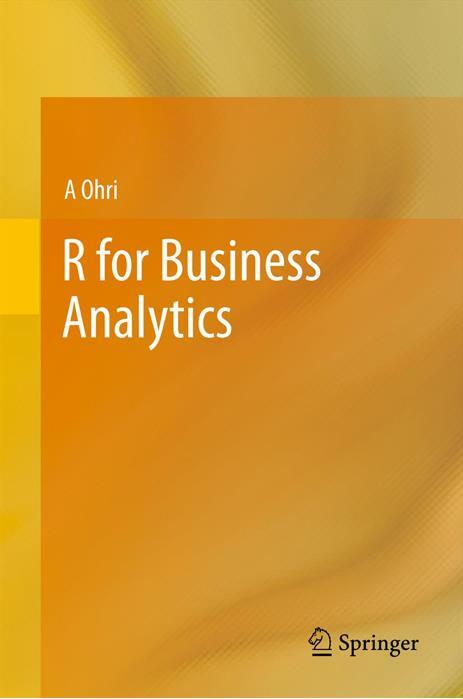 Whether you like it or not, R has quite a steep learning curve for most people, and allowing them to analyze data with R through a graphical user interface on the web as a first step, could start the adoption of R in less technical areas. Ajay- Any plans to make R (CRAN or Github) packages to help with these solutions? 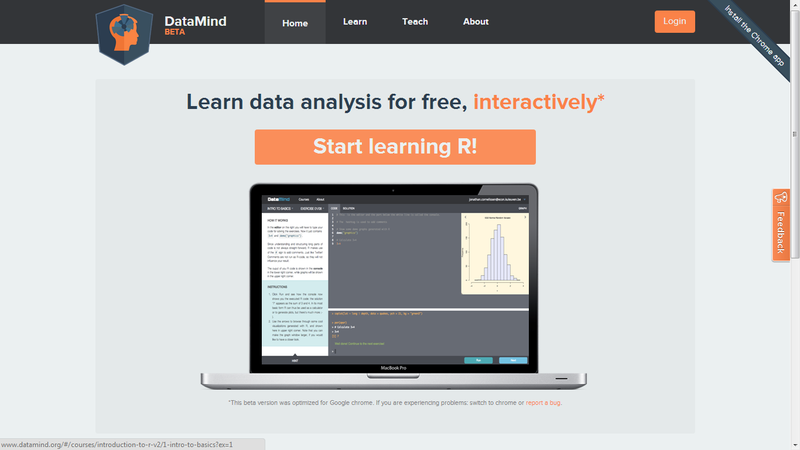 For DataMind, we are working on an R package as well to make the creation of interactive courses easier: https://github.com/jonathancornelissen/datamind. 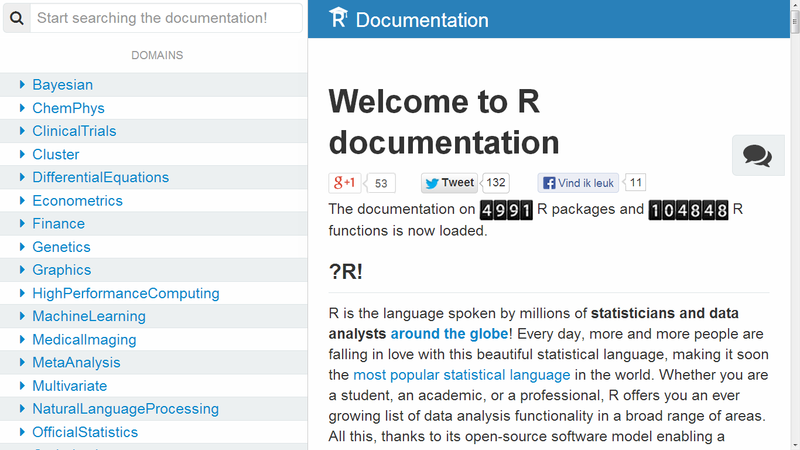 A part of this R package is actually just a wrapper around the great Slidify package (http://slidify.org/). Ajay- Describe your work life balance at a tech startup? Jonathan- Hmm, work life balance J?